An increasing number of Germans – Protestant and Catholic alike – are leaving their churches, according to statistics compiled by The Wall Street Journal. Among the reasons cited for the decrease in membership is an unwillingness to pay a de facto increase in Germany’s church tax, which is collected by the government from registered members of churches to fund those religious organizations. The fact that church taxes even exist might surprise Americans, as the U.S. Constitution’s First Amendment prohibits the government from collecting taxes for religious groups. 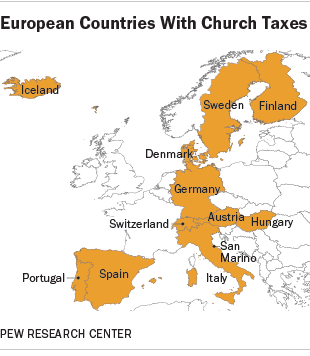 But last year, Germany reportedly collected $13.2 billion in revenue for churches. In Italy, taxpayers pay an “eight per thousand” tax (0.8%) and express their preference for whether the money should go to one of the religious groups listed (including the Catholic Church, several Protestant groups and the Jewish community) or the state. Spanish law “provides taxpayers the option of allocating a percentage of their income tax to the Catholic Church but not to other religious groups,” according to the U.S. State Department. The Evangelical Lutheran Church in Denmark – the country’s national church – receives funding through a specific church tax imposed on members and also receives additional support from the Danish government. Denmark reports that nearly 80% of its people were church members as of 2012. Two other northern European countries – Sweden and Finland – also collect church taxes from members, both at rates that range from 1% to 2%. Iceland’s church taxes are collected from members of registered religious groups – including secular humanist organizations. In some of these countries, there are churches that will only serve those who have paid up. For instance, the Catholic Church in Germany has forbidden those who do not pay their church taxes from receiving communion.